Writing about logistics, supply chains, and global assemblies of assembly. This is a preprint of an article that appears in the Spring 2018 issue of Anthropology Quarterly, part of the special collection on Unseen Connections: The Materiality of Cell Phones. Housed in factory dormitories in China, assembled in Mexican maquiladoras, and put to work soldering connections in Vietnam, Thailand, and Taiwan, are the diffuse network of human actors at stake in the machinations of global manufacture. Western consumers—with limited opportunity to investigate personally, identify politically, or become familiar socially with these workers—know of life in the factories and warehouses of the global manufactory mainly through accounts published by journalists, the dissemination of corporate audits, or reports gathered by governments and non-governmental organizations (for a sample see Greenpeace 2007, Global Witness 2009, Gilman 2011, Duhigg 2012). But this knowledge can also come from the objects of production themselves. By chance, in rare cases of unintentional inscription, traces of human actors are found surreptitiously captured by the very phones, laptops, and cameras they have labored to produce—unauthorized communiqués that reveal the social relations involved in the manufacture of electronic devices and which attest to the lives and labor of the (usually invisible) actors responsible for them. Subsequent dissemination of the image in technology forums and newspaper articles brought with it a wide-ranging affective and analytic response (Perlow 2011, Timmerman 2010, Roy 2011, Nakamura 2011). Echoing Mitchell’s initial reaction, many observers struggled to reconcile the image with a productive process they either knew little of or had never thought about. For some commenters, it seemed to present a less mediated (and consequently, more personal) knowledge of an otherwise abstract mobile supply chain. While Foxconn, the manufacturer, admitted that the disclosure was a mistake, it was, the company hoped, “a beautiful one” (Timmerman 2010). Indeed, the appearance of the worker’s body, her face, and most significantly, her smile, reinforced existing assumptions that global production was fundamentally fair and humane, that workers were basically happy, and factories safe and clean. The image offered a means of “humanizing” its own manufacture, an epistemological “reminder” for viewers to recognize that “actual people make the stuff we buy…and these people have slightly crooked smiles and slightly crooked caps” (Timmerman 2010). For critics, however, there was little value in this portrayal of the material “reality” of the worker. “She does look happy,” wrote one, “for someone who is paid twenty cents an hour.” After all, “the picture can’t tell us if she is working sixteen hour days.” “Besides her smile…we have no indication of the working conditions,” one person suggested, “or her age” (Macrumors 2008). As the discourse expanded beyond the 690 comments on Mitchell’s “MacRumors” thread, the image became part of a simmering public debate on the state of meaningful public knowledge about production, implicating all manner of actors, from Apple to Foxconn, to Chinese, American, and European political and economic structures. Regardless of their position, commentators and critics alike seemed to come to a common concern: just how had they understood the productive apparatus of the mobile telephone, and could this image alter the foundations of that knowledge? Did it offer only mere embodiment, a sort of digital corporeality devoid of any deeper meaning and which could produce only partial insight? Or did it constitute an alternative foundation for public understanding—the common patterns of mediation and forms of representation that constituted the very ways of knowing manufacture? In other words, how individuals outside the regime of production had come to explain its workings to themselves, and, indeed, what means constituted valid contributions to the cultural context behind those explanations. The image of the “iPhone girl” seems to break with the prevailing mechanisms which have mediated contemporary understanding of the mobile phone’s manufacture. In this way, it provides a frame for investigating how that knowledge has been constructed. In this article, I examine the historic fetishization of the telecommunication network by comparing the imagined mechanisms for understanding the supply chains of companies like Apple with the public epistemological practice of Western Electric, the principal manufacturer of the telephone in the early 20th century. This is not to claim that this history presents a mechanism of knowledge entirely equivalent to contemporary practice, but to suggest that a comparison between the material circumstances and conceptual understanding of their respective supply chains reveals a troubling legacy of deficiencies in the knowledge of production, a history of telephonic fetishization, and a pattern of misrecognition regarding relationships within the productive network. Figure 1. Photograph of a factory worker in Shenzhen recovered from the iPhone of Mark Mitchell, Macrumors (August 2008). Of all the unsanctioned images that have since surfaced—other anonymous Foxconn workers, men at an HP laptop testing facility, women at the Nokia Lumia factory in Tamaulipas—it is this image, of the young woman who has come to be known as “iPhone girl,” that is most recognizable.1 Standing at the last leg of the mobile phone supply chain, she has become an emblem for a whole class of otherwise abstract actors—a factory force, usually young, predominantly Asian, comparatively skilled, and, more often than not, female (Roy 2011, Grace 2013). So too does her image encapsulate a failure of knowledge about manufacturing processes on the part of the consuming public. I suggest that the most notable feature of the discourse surrounding these images is their explicit reference to not only what the public knows about the productive apparatus these images represent, but how they know it. In forums of debate, representations of these “phone people” become claims for insights—for or against particular sorts of knowledge—into not only the devices, but the material networks, the supply chains, from which they are wrought. This comes as critiques and commentaries, both scholarly and political, demand increasing consideration by corporations and their consumers be directed to the impact of these assemblies (Rivoli and Waddock 2011). To suggest that one should know how one’s phone is made—i.e., how, by whom, and in what circumstances—is to advocate for a very particularly public knowledge of production (see Dent, this issue). Much of the critical reflection on these images has attempted to position the politics of consumption within the material conditions of the productive network. Despite her smile, the factory in which the “iPhone girl” works has been accused of human rights violations (Hutcheon 2008). Despite these accusations, she still smiles from behind the screen (Perlow 2011:246). The photograph may in some ways “degrade the presentation” of the worker’s self, but visual studies scholarship suggests how the transportive quality of these representations nevertheless brings them into circumstances from which that self had been denied representation (Sekula 1986, Mirzoeff 2005:337). More concretely, while the device in question has been given (by its designer, and by its users) a voice, the image of the “iPhone girl” has been able to offer the device her body and her face. The image of her face is what demands a response (Sontag 2003, Butler 2007, Levinas 1969:50-51), rupturing the commodity’s usual capacity to mask its own social origins by confronting the consumer with knowledge of the network of production. Such demands, the demand for a response made when humans encounter one another, can transcend even the most fetishized products of industrial manufacture and the apparent spatial, economic, and affective disconnections drawn up between their consumers and producers (Perlow 2011:246). Ananya Roy has argued that the “once invisible” Shenzhen assembly line is now, through this representation, made visible, recognizable, and negotiable as the site of various worlding practices. The image of the worker, Roy suggests, leaves behind an indelible trace on the device she has assembled, on which she asserts both her place in the “global value chain” and which works to realize an “imagined community crafted through the transactions of the global commodity” (2011:316). This accidental attachment (or, in Roy’s suggestion, the intentional assertion) of images and narratives to the manufacture of mobile devices (and here, captured in memory, to the devices themselves) suggests how—through representations of the “human materials” of the productive network—consumers might become more able to recognize their alienation from them. Such recognition remains difficult. Particularly so, as modern devices are complex and (in that complexity) hostile to interrogation. They remain frustratingly opaque, obscuring their own origins and workings, and, in so doing, provide little reason for consumers to question their relationship to the device’s production. The consumer does not think about being alienated from the production of her or his phone; the consumer rarely thinks about the network of production at all. When such thoughts do arise, they find that the available information remains fragmented and partial. Confronted with the vast scale and staggering complexity of the mobile supply chain, people find in the most minor human or material trace a rich wellspring of knowledge that they stretch well beyond what it could reasonably be said to have accounted for. Daisey reflects on the disjuncture between these representations and his own understanding as a consumer. He continues, perhaps appropriately, with a question of fidelity. “They’re not very good pictures,” he suggests; “the third was totally out of focus,” and the fourth featured a woman “looking off in another direction” with “no expression on her face.” But the question he asks next takes on a profound meaning for his performance: “who are these people?” He had “never thought,” “ever,” he considers, “in a dedicated way, about how [these devices] were made.” Struggling to reconstruct the rapidly receding memory of what he might have thought, what he might have imagined about manufacture and assembly, he can only conclude that, “I think what I thought is they were made by robots […] an image in my mind that I now realize I just stole from a 60 Minutes story about Japanese automotive plants—I just copy-and-pasted that” (2011). The material epistemology of the mobile phone is the way in which one comes to know the device, especially through the device itself. In emphasizing this sense of material knowledge, I extend the work of scholars such as Davis Baird and Andrew Pickering (Baird 2004, Pickering 1995, Zimmerman 2009). While epistemology might be thought as mainly a human affair—bound up in what is imagined by the self and shared among society—things have their own role in the production of knowledge (Baird 2004:xvii). Just as Baird’s reincorporation of scientific instruments into theories of scientific knowledge requires understanding how they mediated its historic production, the mobile phone requires its own remediation. In particular, it requires the realization that these devices serve as the very tools through which we come to know what we know about an ever-distant world, that our knowledge of them—to such an extent as it can be said to exist at all—must necessarily enroll not only the media forms, social structures, and human sensations that these things produce, but, indeed, the things themselves. It requires pulling apart these “material assemblages” (Farquhar 2015:226), in order to find an explanation of the means and mechanisms, both external and internal, for how one apprehends a device like Mark Mitchell’s mobile phone—if it is smooth or shiny, crafted or machined, a singular artifact from a particular time and place or a homogeneous commodity of interchangeable value, form, and function (Kopytoff 1986, Heidegger 1977). As Daisey performs the breaking of his own imaginary—and the formulation of a new material epistemology—his singular representation gives way to surprising scale. “If this phone has four pictures on it, taken by hand in testing, then every iPhone has four pictures on it, taken in testing, every iPhone in the world…by hand” (Daisey 2011). The glass of the phone, to invoke Bill Brown’s Lacanian metaphor, has clouded (Brown 2001:2-3). Rather than look through it as an object, Daisey can now look at the thing-in-itself. This is both a new kind of knowledge—that every iPhone is made by human labor, not machines—and a new mode for the realization of that knowledge—that is, that the device itself contained knowledge of its origins, and not only its own circumstance, but as a “material trace” of the entire network responsible for the conditions of its manufacture (Zimmerman 2009:116). In the time since this photograph was first uncovered—since the release of Apple’s first comprehensive supplier list in 2011 and the institution of its (now) yearly progress report audits—a continued stream of accidental disclosures has coincided with an increased public interest in the mobile supply chain, prompting examinations that have ranged from investigative journalism to more radical activist interventions.2 The affective response to these images, particularly to their mode of transmission and the ways they afford novel encounters with the productive process, seems to stretch the limits of mainstream consumers’ knowledge of the productive network even as it works to deepen their dissatisfaction with how that network had been previously represented. For a certain register of public discourse, the representation of workers within the device now remains the only meaningful indicator of their real existence outside of it—even if these mega-pixeled montages also serve to reinforce their own inability to capture the total scale of production, the supply chain, and the network. The mobile phone is a networked object, not only literally within the telecommunication network, but like all global productions, as an entity inescapably enmeshed in the material network of its assembly (Holmes 2012). It is housed in plastics molded in Ecuador, Saudi Arabia, and Russia. It is comprised of metals (aluminum and titanium) and glass (Gorilla and otherwise) bought from Africa, South America, and Asia. The batteries are made from cadmium, nickel, and lithium fashioned sometimes in the United States, but often in Chile or Japan. Each requires components—speakers, microphones, clocks, and sensors—imported from East and Southeast Asia. The circuit board and memory arrive occasionally from Japan and Malaysia, but more often from China and Taiwan. Littered throughout these components are metals—gold, copper, tantalum, tin, and aluminum—drawn from South America (in places like Chile or Brazil) and Africa (from South Africa and the Congo). These myriad and precious ingredients are identified, gathered, processed, and assembled in factories in some of the poorest regions on the earth. As an actor-network these devices must be figured further—as socially instantiated commodities, heterogeneous productions made with heterogeneous engineering (Law 1992). Plastics are fused by (and with) people. 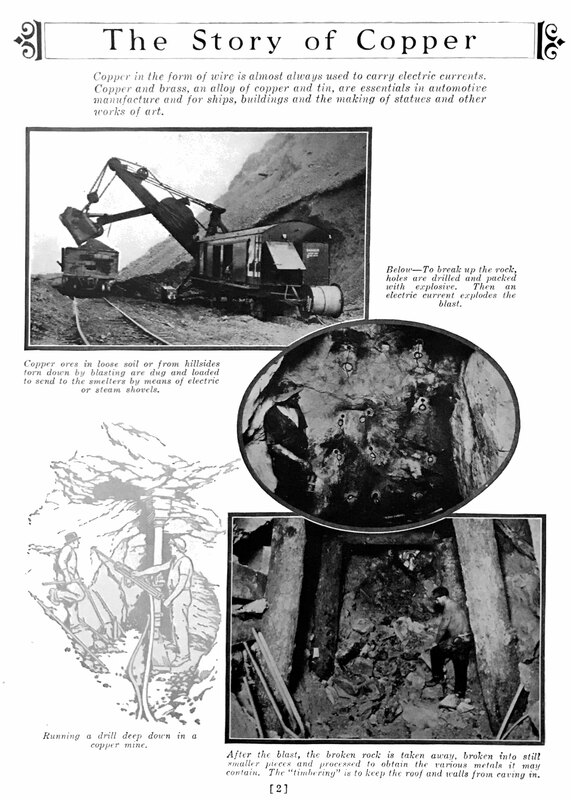 Metals are produced by first producing miners, then producing mines (see Mantz, this issue). To an already troublesome litany, a comprehensive account must add actors, sites, and politics—both lives and ways of life. Figure 2. Manifest of Apple suppliers as reported by the company’s supplier list (2013). After more than a century of changes in production (see Boltanski and Chiapello 2007), the calamitous reach of the commodity chain stands as a monument to global capitalism. Accounting for what it means to know the supply chain of a device like the mobile phone—and to raise the standard of what consumers should know—requires understanding not only what forms such knowledge may take, but the mechanisms through which that knowledge might be produced. Rather than focus on the distant designs of its production, critical work on the mobile phone has largely chosen to emphasize knowledge of it as an object of consumption (see Chang 2008, Ito 2005a, 2005b; and also Goggin 2006, Yoshida, Mennicke-Schwarz, and Feigefeld 2012). This construction—as an object of desire or an emblem of personal identity—has not even been limited to the bourgeois sensibilities of Western consumers. In Factory Girls, Leslie Chang describes how immigrants in manufacturing cities identify with their phones, devices they both craft and consume. “I need to recharge. I am upgrading myself” (2008:96). The mobile phone is, indeed, a fascinating consumer object. Although the device can (and does) become shared, common property within larger social groups, families, villages, and tribes, it remains potentially private to an extent not possible for more traditional telephonic predecessors—indeed, to an extent rarely evident in the history of any comparable machine. As “liberating and expressive personal technologies,” mobile phones are, if not wholly cyborg technological attachments, at least portable enclaves that resemble them (Ito 2005a). They signal the availability of their users for interactions that can be overwhelmingly de-contextualized, open to nearly any kind of use in nearly any circumstance (See Ito 2005b, Varnelis and Friedberg 2008). But the difficulty in these figurations is that they have disproportionally emphasized not only the objects themselves, but the consumers who appear in only the final pages of their biographies. If, as Igor Kopytoff has suggested, the “singular and the commodity are opposites,” standing at either end of a scale that measures their value, then the majority of inquiries, rather than investigating commodities to fill in missing accounts of their abstract and uncharted networks, lean far to the other side—following the personal consumption of essentially singular artifacts with already well established, if limited, histories (1986:87). This lack of information about the mobile phone’s production is the same familiar absence with which all the objects of modern life surround themselves (Žižek 2008). Its pervasiveness suggests already and always the idea of the fetish, the character of the commodity an “enigma,” as Marx wrote, rather than the product of the labor which had produced it (1976:164). In exploring the idea of the fetish as it applies to our mobile phones and their supply chains, some striking suggestions emerge. Patricia Spyer has suggested that fetish objects come, first of all, as hybrids, pieced together out of, and to render complete, otherwise heterogeneous elements of their production (Spyer 1997). In the historical account given by William Pietz, the fetish object emerges as a sort of “material embodiment” of its disparate elements, but he describes the overriding logic of the fetish as that of the Hegelian “object of the Spirit that failed to participate in the idea.” In this failure, he writes, it had “never experienced a negation” and, consequently, never found synthesis to any truth beyond materiality (1985:8). To figure mobile phones as such objects, as consumer curiosities formed from hybrid networks, is to have consumers like Mitchell and Daisey emerge as fetishists. They are unable to decide on the implications of their belief, unable to consider the phone not just as congealed commodity or personal possession, but as the individual product of a perilous and particular network of production. Rather than choose one understanding over another, to admit their complicity in the consequences or deny them outright, they look to the device and its inscriptions. But instead of placing them in an integrated reality, a complete object in all its Hegelian truth, their epistemological strategy attempts to hold the broken halves together. The phone becomes a material machine, but one somehow divorced from the marks of its manufacture. The logic of the fetish is of misrecognition and displacement. It allows the fetishist to hold onto two contradictory notions without accepting inconsistency. It allows a commodity like the mobile phone to be understood and imagined absent its productive network. Not facing the alienation of labor or loss of social relations, the commodity fetishist mistakes what had been relations between people as relations between things. But it is a willful misrecognition, a refusal to acknowledge the change that the commodity has brought to the structures of society. For writers like Pietz or Slavoj Žižek, this intentionality is how the process of disavowal can be said to be the same for the sexual fetishist and the shoe as it is for the peasant who mistakes the king for a king “in himself.” Appropriately for the supply chain, Žižek describes this fetishization in its most general form as a confusion in terms of the network of relations—not so much the “famous replacement” (2008:14), but rather a “certain mis-recognition which concerns the relation between a structured network and one of its elements.” “What is really a structural effect, an effect of the network of relations between elements,” he writes, “appears as an immediate property of one of the elements, as if this property also belongs to it outside its relation with other elements” (2008:19). Things now appear to have value outside of the network—just as a king might have appeared to have a right to his rule even though he was king only so long as his subjects believed themselves to be subjects (Žižek 2008:20). If, as Freud suggests, everything “has to be paid for” (1938:373-374), the price that is paid in this move is that not only is the social character of production obscured, but, as a necessary consequence, the “human materials” responsible for it. We know that the commodity’s value comes from the labor needed to produce it, from the network of actors responsible, but we now proceed as if this value were an innate property of the thing arising only in response to a kind of sublimation of design and demand. Just as the sociality of production is obscured by the commodity fetish—by the mistaken appearance of relations between things—so too do all manner of other relations (including belief, superstition, and imagination) now come to be embodied by things (Žižek 2008:22). The point of Marx’s analysis, Žižek concludes, is that “they no longer believe, but the things themselves believe for them,” explaining that “it is as if all [capitalist subjects’] beliefs, superstitions, and metaphysical mystifications, supposedly surmounted by the rational, utilitarian personality, are embodied in this mistaken appearance…” (Žižek 2008:31). Extending this line of thought to our knowledge of mobile phone production, I suggest that this may prove useful. If we can no longer know, then the things, it could be said, must be made to know for us. This theorization also explains why, given the global supply chain a network of gargantuan proportions, the ways of knowing that network remain so bound up in the language of belief—the hedged phrases and qualified claims of how things “seem,” or “appear,” of how the landscape of production and the workers that inhabit it had been “thought,” “wondered,” “hoped,” “assumed” or “imagined,” of what had been “believed.” (Macrumors 2008, Timmerman 2011, Cook 2011). As consumer objects from far-flung supply chains, devices like the mobile phone can be taken by those outside the productive apparatus as emblems of an altogether othered process of production. That is to say, with a gesture to Roy, a process that is primarily imagined, rather than personally experienced. Things provide connections, but the extent to which those connections reach beyond the commodity is no longer contingent upon the ability to actually see them, but the capacity to imagine they exist. As Kwame Appiah suggests, it is the pathways “made in the imagination” around the cultural objects of society that remain “among the realist” we have (Appiah 2006:135). Indeed, while productive networks might appear to be merely material structures, it seems that the knowledge and meaning of them—however disjoint it may be—can be made only within these fragmented frameworks of fantasy. But there is a danger here as well. As the material circumstances of the network shift and flow beneath the device’s shell, an incomplete understanding of the conditions of its workings can inevitably produce only partial—and temporary—recognition, the history of a single moment in the network taken as the basis of broad knowledge about its origins, structure, and function. Such associations—partial and temporary they may be—nevertheless seem to operate as surprisingly stable claims to knowledge in the minds of the public. Actor-Network Theory accounts for the movements of its actors with precisely these sorts of imaginative mediators—socially durable (if “factually” false) artifacts of prior patterns of connection (Latour 2010). In his critique of Actor-Network Theory (and of its semi-regular proponent, Bruno Latour) Arjun Appadurai has called into question the fundamental politics behind tracing these sorts of associations. “If the only sociology left is the sociology of association,” he asks in reference to Latour’s famous call to action, “will the only guilt left be then guilt by association?” (2014) But indeed, it is exactly this kind of associative logic that seems to be at work in public understanding of the apparatus of production, and indeed, of nearly any network. The attempt to unravel the network’s misrecognitions amounts to an attempt to catalogue its imagined associations and to expand them into sources of situated understanding and knowledge in their own right. In the language of Actor-Network Theory, to exchange the intermediaries, which had been taken to merely replicate, transmit, or “conduct” meaning, for mediators that now “transform” and “multiply” meaning and that should, as a consequence, “count” for something in the interpretation of the network (Latour 2005:40, Maurer, Melms, and Rea 2013:57). That the means for making these mediators “count” remains so limited is partially a result of the completeness of the object’s fetishization, and partly a symptom of human interests. It is easier to look to established categories of meaning than it is to follow unfamiliar ones towards entirely unfamiliar consequences. Not remarkably, the supply chain ruptures that inspire the most severe reaction and the most careful investigation are those which require the least translation. These are the chains that lead back to the safe health of Western consumers’ bodies. The recurring reports of metal contamination in children’s toys or scares over pet food and medicine—issues affecting Western consumers—receive prominent and widespread media coverage (See Barboza 2007, Barboza and Story 2007, Schor 2010, and Singer 2010a, 2010b).3 Accounts of artisanal mining, environmental degradation, and social unrest—issues pertinent to source communities and workers on production lines—have, with the exception of some outlets like the New York Times and Washington Post (Duhigg 2012, Frankel and Whoriskey 2016), remained mired in the debates of online-only op-eds. The difficulty is, that with devices “designed in California” and “made in China,” there seems to be little room to imagine the space between the two. Although there are myriad epistemological mechanisms to fill the breach, from journalistic inquiry to activist and scholarly debate, the preferred form of knowing in contemporary production, the most influential, the most credible, and the most widely shared, is the audit—more precisely, the corporate supplier audit (on the contemporary foundations and presentation of supplier auditing and corporate social responsibility, see Gray, Owen, and Maunders 1987, Christopher 2016, on audit practices more generally, see Power 1997, Strathern 2002, and Riles 2006). Regardless of the actors who might commission them, such inquiries take on a strikingly similar shape. Investigators go out to the sites of production to account for the quality of manufacture, quantities of output, and (increasingly) the signs and signals of violations in standards of corporate responsibility (Apple 2016). Galvanized by fears of economic crisis, a suspicion of the corporation stemming out of a “long 1970s” (Balakrishnan 2009), and, more recently, an expanding discourse around globalization and environmental degradation, actors deploy these investigations to critique what they view as the corrosive reach of unaccountable supply chains.5 In subsequent reports and recommendations from governments (US Department of Labor 2009, US Government Accountability Office 2014) and advocacy groups (Liu and Deng 2005, Greenpeace 2007, Global Witness 2009, Friends of the Earth 2012), critiques of prominent companies like Apple, Samsung, and Sony have often come to stand in for (and above) a whole host of companies, from the familiar (Nokia, Microsoft, RIM), to the obscure (Maxwest, Meizu, and Mobiado). These are carried, in turn, from the pages of reports into political arenas and their respective legislative assemblies (for example, see Mantz, this issue, on the Dodd-Frank Act, Balakrishnan 2009, Carrier and Luetchford 2012). Still, every problematic piece of journalism, each report or recommendation recounting these audits, includes the recurring caveat—a kind of buyer beware—that the company in question may not, itself, be knowledgeable of the full scope of the problem.6 It seems that it is not only the public that has limited knowledge about the process of production, it is often the producers themselves. One purpose of the audit, then, is for the productive apparatus to know itself. With even the most powerful purveyors of consumer electronics rarely in the position to know their supply chain in any direct sense, audits and similar investigations are deployed by corporations to investigate not only the actions of the company but, to the perceived extent of legal or social liability, those of their partners and suppliers. Broader awareness comes as regulations push firms to “map the supply chain,” take steps to “reduce or end problems by exerting influence on suppliers,” and to “report publicly about their involvement” (Friends of the Earth 2009:7). While the contemporary impetus for sharing this information comes from largely external demands to anchor the “responsibility” of Western corporations to the “total supply chain” (now the expected position of Western corporations towards client companies and protectorates, see Locke 2003, McFarland 2008, Benson 2010, and Mantz, this issue), this has not always been the case. In comparing the mobile phone to the conventional telephone, we are able to compare differences in the material and conceptual construction of their supply chains. In so doing, we begin to see that the history of attempts to publicize knowledge of production in telecommunication, and of the imaginative labor required for it, stretches far back, before the practice of the audit and into the foundations of the earliest ideologies of the network. This sense of unrestrained and (seemingly) unmediated exchange brought with it a universal character, a new “democratic” tradition under the stewardship of an organization that would come to be called, positively and pejoratively, the “Bell Democracy.” Indeed, the early 20th century is marked not only by transformative shifts in the nature of communication, but by the unprecedented reach of the monopolies governing its distribution. While the constituent companies of the Bell System varied considerably over its complicated history, it suffices to say that the Bell Telephone Company gave way to a sprawling assembly of corporations over which it exerted both legal—through ownership of patents, corporate stock, and contracts—and social control—with common directors, board members, and technical standards (for a more expansive history of early telecommunication, see Smith 1985, Lipartito 1989, John 2010, and Hochfelder 2012). The Western Electric Company of Illinois was recognized as the cornerstone, as both the manufacturing arm of the Bell System and one of the largest electric suppliers in the world. It was the Foxconn, one might say, to Bell’s Apple. And just as manufacturers like Foxconn and Quanta sit at the center of the mobile phone supply chain today, there is no actor more central to an investigation of the public knowledge of production in this period. At Western Electric abstract ideals of communicative service were attuned to the material form of objects like the candlestick telephone, with its raw materials coming to the company’s Hawthorne Works “from every corner of the earth” (WE 1927). But the discourse surrounding telephones and their production at the turn of the century was markedly different from current discussions about mobile phones (Fischer 1994, Smith 1985). This is true both in terms of the public perception of the social impact and in how knowledge about the phone was disseminated and mediated. Whereas contemporary discourse—as seen in audit reports and investigations of the social and environmental impact of supply chains—is characterized by fear for the future and anxiety around distant productions, early 20th century advertisements celebrated hopeful legacies of a glorious past ground in the marvels of American manufacture. Western Electric’s factory in Chicago was offered as the material manifestation of not only a network, but a nation—the unifying proverb of the country, forged in the fires of a single corporate actor. “Out of the melting pot…your telephone” (WE 1923a, 1932). The arrangement that brought the company into the Bell System had itself arisen partly by chance. When the contentious 1879 patent dispute ended with Alexander Graham Bell, rather than Elisha Gray, assuming exclusive rights to commercialize the telephone, it had seemed that Western Electric would be out of the market (Smith 1985:34–35). But it soon became apparent to American Bell Telephone that mass production of its apparatus required both more regular equipment and a more thorough understanding of the material standards for electrical production. With Western Electric having effectively pioneered the manufacturing know-how and business relationships already, Bell became a shareholder in the company and Western Electric became the exclusive provider of Bell telephony. Over the next half-century Western would market its telephonic technology alongside its electrical line, both to businesses—offering isolated interchanges of electrical efficiency—and to rural markets where telephone lines did not yet run. “If efficiency is the science of saving useless motion,” its products were now to be synonymous with it (1915b). Modern offices would be “keyed up with each department and division in instant communication” (1915b). With this call to electrical efficiency and communicative modernity, the idea of direct communication and control as the preferred pattern for daily life came to eclipse the Bell System’s refrain of “service” in Western’s marketing and memos.12 This message, which still remained Western Union’s company line, had long been the framing vision for communication (see again Smith 1985). As historians of the company have suggested, the telephone, and the related kinds of technologies Western Electric marketed both within, and without, the Bell System, were an altogether different kind of object—one that required a new kind of understanding, and which brought with it a new way to market and mobilize the materials of telecommunicative production. Figure 3. Cover for From the Far Corners of the Earth, Western Electric (1927). There is little doubt that objects of communication like the telegraph had been known to their public in a fundamentally different way than the telephone. Companies like Western Union had gone to great lengths to emphasize the quality of the service they were offering, and other manufacturers (including Bell) had followed suit. While the concerns of the telegraph’s customers had been defined primarily by the reliability of a human operator, or the speed and efficiency of the messenger’s delivery, the telephone took on a different, and more personal, kind of association. It was a product, but one that wasn’t sold and couldn’t be bought.13 What had been the abstract service of telegraphic transmission was now housed within the familiar confines of consumer homes and business offices. In place of the skill of telegraphic personnel in deciphering pulses of electrons, telephone subscribers interfaced directly with the technology. This proximity made the materiality of the apparatus itself, rather than the reliability and specialized knowledge of its human operator, the subject of various companies’ competitive claims, and the careful composition of the precious metals housed in the telephone were seen as directly corresponding to the quality and reliability of a call. With the expiration of the original telephone patents in the closing decade of the 19th century, Western Electric began to face its first real competition since joining the Bell System. The competing (previously off-patent) telephone manufacturers who comprised the opposition telephone movement wasted no time signaling the material makeup of their devices in their competition with the previously intransigent monopoly. The Best Telephone Manufacturing Company, for example, trumpeted the material superiority of its speaking telephones by printing the letters of its always satisfied (and suspiciously well-placed and well-informed) customers. “It would have been satisfactory on iron wires,” goes one 1896 letter, “copper simply increases the effectiveness” (Best 1896). Western Electric’s catalogues, circulars, and advertisements over the next few decades can be read then, not only as windows into an unprecedented period of industrial pride, but as forceful statements of a corporate identity reimagined as service manifest through materiality. This was all the more necessary because, while Bell, and to the extent possible, the telephone, were well known, Western Electric wasn’t. Until 1907 it had been “a corporation selling seventy million dollars’ worth of its products yearly, yet almost unknown to the general public” (Collins 1908:1-2). As business writer and editor James Collins suggested, this made it “something of an oddity” in the American commercial landscape (1908:1-2). Its marketing had been primarily internal, or limited to its business of electrical equipment. Its efforts on those accounts, although quite significant, remained confined to the pages of electrical journals and the anticipated publication of its annual Supply Year Book. While Western had published pamphlets and other “mail-ins” before, AT&T’s 1914 publication of the advertisement “Unseen Forces Behind Your Telephone” alongside similarly emphatic serials like its Telephone Almanacs signaled a shift that both confirmed Western Electric’s place in the larger Bell System and expounded on the structures of its network through parable and prose. Here the telephone was not only a tool for communication, but one imagined as an “instrument of common sight” which, the advertisement claimed, brought with it a particular knowledge of a distant world (AT&T 1914). “Unseen Forces” celebrated the company’s infrastructure and the (then) eight million telephones installed throughout the country. The grandiose sight of telephone poles, “strung with wires and cables,” it recorded, had grown to quantities sufficient “to build a stockade around California” (AT&T 1914). With twelve million poles went enough wire—fifteen million miles—to coil the earth 621 times. Its thirty-six miles of switchboards and machinery, one thousand buildings that could “house a city of 150,000,” and as many employees as the entire population of Wyoming, were presented “to give…some conception of the great number of persons and the enormous quantity of materials required to maintain an always-efficient service” (AT&T 1914). The material biography that was only hinted at in promotional materials like “Unseen Forces” received complete coverage in Bell’s internal magazines and in publications like Western Electric’s fifteen-page booklet “The Making of the Voice Highways,” released the following year (WE 1915c). Like many of Western’s early attempts at long-form content, it bridged nostalgia for the history of communication with a futurism steeped in promises of radical transformation. Before the telegraph, before Bell’s telephone, the booklet reminds, it was “the highway—the public thoroughfare—that served for the transmission of messages,” and it was the messenger who was the most reliable means to “deliver the written word to its destination” (WE 1915c:1). But these ancient methods were “inefficient,” governed by the cruel contingencies of geography and circumstance. The telephone, its aerial arteries running above the old public roads, brought an “open avenue of communication… when all other means failed” (WE 1915c:1). Lead-covered cables, to which the authors of the booklet attributed all manner of aesthetic and practical qualities, “inconspicuously and inexpensively,” transformed these lines into underground pathways of communication—a more modern thoroughfare for regular and reliable connection (WE 1915c:2). In the Hawthorne Works of Illinois, “enormous quantities of this cable [were] manufactured each year,” and there was “nothing more interesting than the manufacture of lead covered cable” (WE 1915c:2). All the better, then, that the bulk of “The Making of the Voice Highways” devoted itself to illustrating exactly that. It is only as it looks for “what it means to manufacture” that the pamphlet finally suggests that “some consideration of the raw materials may be in order,” along with their “interesting histories” and places of origin (WE 1915c:2-3). While later documents may have treated more problematic productions, the kinds of cables the company was producing in 1915 were hardly so complex. “In its simplest and most usual form,” the pamphlet reads, a standard cable required only four raw materials of any significance: “copper for the wire; paper for the insulation, and pure lead, or an alloy of lead and antimony, for the sheath” (WE 1915c:3). While standards had long been part of commodity purchasing, and mechanical manufacture had required rigorous measurement and testing in the pursuit of fit, electrical productions were the first to demand both at any kind of scale. It is here that the claim to a material bona fide finally appears. While earlier sourcing may have been a haphazard affair, specifications for purchase now provided a concordance between the governing requirements of manufacture and the complex geographies increasingly required by telephonic production. Testing at the scale of Western Electric required sampling shipments to determine not mechanical fit, but electrical aptitude, with purchasing itself taking on an increasingly scientific character. The logistics of supply rested on a new paradigm of efficiency. For Western, this required a continuous search “for better ways of doing old things” (WE 1915c:14). It demanded flexibility. This demand becomes apparent as the text moves to the act of production itself. Later accounts of Western’s cables speak of “carrying New York’s telephone wires under a river,” complete with the militaristic motions of cablemen “marching down the field,” and the colonization of remote geographies with “telephone wires leaping” across the confines of Arizona’s Gila valley” (Bell 1931a, 1931b, 1931c), but the copy outlining the manufacturing of the “Voice Highways” seems only to thirst for knowledge of the invisible materiality in its invisible infrastructures (WE 1915c). The pamphlet’s reflection on infrastructural connection, particularly in the account of the corporate labor and material pipework required for the flexible flow of immaterial exchange, provided the telephone network with its first biography of materials. But this biography struggled to become, in the language of Igor Kopytoff (1986), a cultural one—imbued with human attachments, relationships, and above all, cultural value and meaning. Over the next few years, attempts to complete the biography would take hold of the corporate imaginary and public perception in a way that had not been seen before—or since. Figure 4. 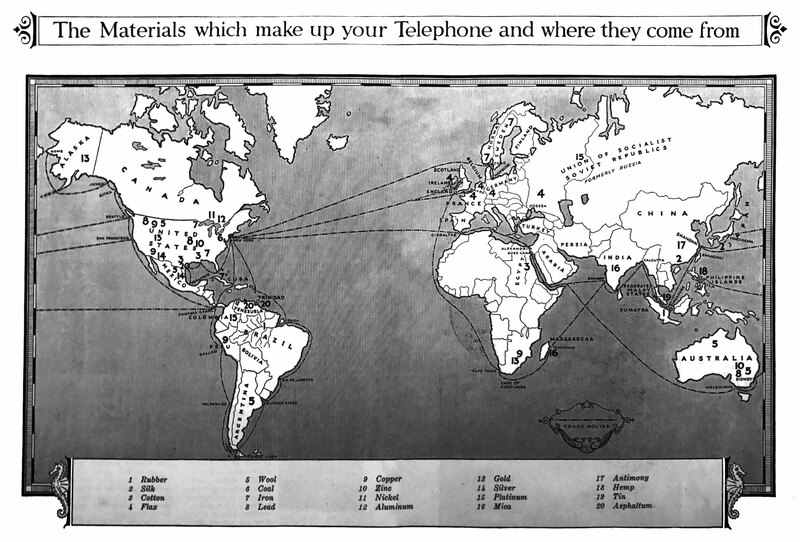 “The Materials Which Make Up Your Telephone and Where They Come From,” From the Far Corners of the Earth, Western Electric (1927). If Western Electric was looking to forestall the fetishization of the telephone’s network, it was already fighting a losing battle. Little more than a decade after “The Making of the Voice Highways,” the infrastructure of the network seemed to have withdrawn into obscurity. The cover of From the Far Corners of the Earth, a sixty-some page pamphlet Western Electric published in 1927, offered little doubt as to the new object of the company’s discourse. It was one which had been featured regularly in the pages of the Western Electric News, meticulously refined over the course of the company’s “material series” campaign. On it, an awesome assembly of production, drawn, as the title suggests, from the “farthest corners of the earth,” stands against the backdrop of the world, and against the product of its labor—the telephone itself. At the center of the crowd stands a generic East Asian laborer, with the artist’s interpretation of something not quite like a straw dǒulì on his head and an almost biãn dãn carrying-stick draped across his shoulders. Part of his face and both of his eyes are eclipsed by thick shadow. Lashed to the stick on his shoulders are baskets of unidentifiable chunks of rock that (we must assume) are constituents of the colossal candlestick telephone behind him. He stands among some thirty men and women, each with turbans, mining helmets, shawls, and sticks. Cargo is balanced precariously on their heads, held in their arms, or strung over their shoulders, as they are accompanied by donkeys, mules, camels, and elephants. A few wear Western dress, but most are clothed in imitation of traditional attire. One man is black (more aptly blackface), most (to the limits of halftone printing) brown and white. Some stand with pickaxes and walking sticks, others with barrels, baskets, and jugs. The formidable assembly of these “strange people” from their “strange lands” were presented, the pamphlet (and its formative advertising campaign) offered, as a means to “tell you more about some of the world’s raw materials—where they come from, how they are obtained, and what qualities lead to their use for different purposes” (WE 1923b, 1927:1). Both men and materials, it explained, came from the nearby “hills of Pennsylvania,” the “treasure-laden Rocky Mountains,” and from foreign locales as far away as “India and Malaysia” (1927:1). While some of the themes of this “postcard pamphlet” had been present in prior publications, gone are devotions to manufacturing the various cables and components of the network. In their place was an accounting of the wide-ranging material composition of the object at its center. Each of these materials (from copper and tin to silk and paper) is given a few pages to tell its story, usually half of which is left to captioned photographs, diagrams, and illustrations. The other half moves between details of the material’s extraction or sourcing and the imaginative account of its awesomely ancient (or mundanely modern) material inhabitance in the grand history of civilization. Over the course of the telling, the reader learns the diverse and divergent stories of copper, cotton, and silk, of precious metals like gold, silver, and platinum. They hear of tin, rubber, lead, and antimony, of paper, nickel, iron, and zinc. Finally, of coal, aluminum, and mica, of asphalt, and of wool. The story of copper, for example, opens at the dawn of recorded history. For centuries, it records, copper was used (by itself or in bronze) to produce common household objects, decorative designs and ornamentation, and (of course) armor and weapons. Coins, too, were common products, and it explains that as far back as the Roman republic “a man’s wealth was often measured by the weight of the copper he owned” (WE 1927:3). The most famous symbol of copper’s place in the ancient world was the Colossus of Rhodes, the wonder of the sun god Helios, cast in bronze gathered from the spoils of war—only to be re-forged, one thousand years later, as new currency taken down and sold off on the backs of nine hundred camels. The account then unexpectedly rushes forward to unearth the deposits of copper surrounding Lake Superior, the sulphidic strains buried deep in the mines of Butte in Montana, to Canada, Mexico, and Peru, the massive reserves of Chile, and finally to Spain and the prodigious porphyrius deposits scattered the world over. The story outlines the circumstances of the metal’s composition, from findings of pure copper, to its various ores intermingled with lead, zinc, gold, silver, platinum, and palladium. With almost tedious detail it explicates the methods of mining, extraction, separation, smelting, and refining. The primary purpose of the metal for Western Electric was to carry electric currents, and the pamphlet outlines the essential place for copper not only in its once vaunted lead covered cables, but in telephone conduits and overhead lines, wire windings, coils in the receiver, and even brass screws. Figure 5. “The Story of Copper,” From the Far Corners of the Earth, Western Electric (1927). In the face of so much naked materiality, one may begin to wonder where the human actors of the cover have gone. By the time a phone was finished in factories like the Hawthorne Works of Illinois or Kearney in New Jersey, the device had been prepared as countless subassemblies, built by dozens of companies and plants with raw materials brought by hundreds of concerns—each passed through the hands of thousands of workers. But despite the credit given to the company’s suppliers at the back of the Far Corners pamphlet, with each new technological complication the human actors seem to have been purified out, increasingly absent from accounts of the monstrous hybrid networks into which they had been installed. In the prior century, the standard-bearer of telegraphic technology, Western Union, had gathered a well-worn cast of characters to familiarize consumers with its service. The most prominent of these were messenger boys and telegraph operators, but early accounts manifested a formidable host of explorers, loggers, line-riggers, ship captains, and railroad conductors. While they continued as the face of Western Union into the 1940s (Downey 2002), the telephone largely displaced the image of technical transcription and fleet-footed messenger with its own ensemble of communication. Bell exchanged the sight (and sound) of unruly messenger boys with the carefully crafted voices and personalities of smiling female operators (see Fischer 1994, Carmi 2015). For Western Electric’s assembly of production, however, even these human actors were largely equivalent to their nonhuman intermediaries. Bell’s women at switchboards stood side-by-side Western’s call bells and ringers (see Smith 1985). Though they continued the Bell System’s broader language of human agency, as the years went by the (comparatively) rich accounts of a productive force of heroic linemen and ingenious purchasing agents began to fade out of view (as did the other figures of the Bell System, see Martel 2004). They had given way to a device whose infrastructural apparatus rested firmly in the hands of a diverse set of exotic natives and nations—even if the accounts in which they appeared figured them as only the most minor of actors. If at the end of the chain that Far Corners records we find the familiar “workman at Chicago,” he is now only “one of the 28,000 men and women at the Western Electric works” who, from a “slab of rubber” and “medley of minerals,” produces the telephone—the sole point of reference for a site of assembly now encompassing the whole of the earth (WE 1923b). The human actors of the narrative, not unlike the mistaken image of the “iPhone Girl,” are important only as the human sources of supply—the Irishman, who “raises flax, used in the condenser,” the “British Indian,” a “swarthy miner of mica,” and the Russian who “mines platinum for your telephone” (WE 1923b). The technological and material menagerie portrayed in the pamphlet was not confined to its elaborate (and expensive) publication. The accounts it externalized had begun with lengthy reports developed out of the company’s purchasing and supply offices. First delivered in vehicles like the Western Electric and Bell Telephone News, these missives from remote sites joined with the dissemination of system and standards to inculcate a particular ethos of corporate awareness and understanding.15 Pilgrimages to the Far Corners could be found in the film reels of The Inside Story of the Telephone (WE 1928; sometimes listed as The Inside Story of Your Telephone), which gave the grainy halftones another life on the screen. Its message was delivered in serial advertisements addressed to prospective employees and other specialized audiences—Life, Forbes, and Time as often as Scientific American, the Technology Review, or the Harvard Alumni News. These publications, along with updates to Far Corners in 1935 and 1939, may appear to suggest continued internal interest, but the external positions of later documents began to differ considerably. Western Electric had already begun to exchange the language of familiar human assemblies for that of seemingly unmediated networks of technology. “Today,” they wrote, “your voice carries your commands… direct to the party at the other end of the wire” (WE 1915b). This refrain, of directness, instantaneity, and efficiency, represented a radical impersonalizing of interpersonal, embodied, communicative practice. “Your own voice is your best messenger,” they had suggested as early as 1912, why “explain your wishes,” when you can “send your voice?” (WE 1912). As if in answer, nonhuman actors increasingly came to replace their more animated analogues over the next two decades. After all, in a Western Electric office one could reach “every man within earshot,” not by means of messenger boy, but by “button-touch” (WE 1914). The 1926 spin out of the company’s electrical distribution business as the Graybar Electric Company, and the 1925 founding of Bell Labs, helped to cement this perspective as it irrevocably altered the character of the company.16 The Western Electric News substituted stories of human suppliers for the impressive innovations offered by the growing research program coming out of Murray Hill. Western’s production of material biographies like Far Corners, initially imagined to attract interest in its sourcing practice and engineering acumen, became fewer and farther between. Within a few years the company’s careful gaze of material fascination had been almost entirely exchanged for some infrequent glances at the sprawling colonial supply chains of telephonic production. Nearly all knowledge of the human inhabitants of the productive apparatus went with it. In the closing segment to one early “industrial” film from 1918, Western had already foreshadowed an almost fantastical fetishization of the very device it would soon struggle to demystify. Absent the vast interiors of the factory floor, outside the lines of workers and the repetitions of their assembly, there is the magical vision of the phone’s 229 parts drawing together in stop-motion succession. Through a “trick” of the camera, each part movies, piece by piece, until a completed telephone results (WE 1918). Components and connections turn, flip, and fold, tiny fasteners and fixtures march like a carefully choreographed miniature army. Cords crawl like inch-worms, threading their way through connections of washers and wires. The phone, seemingly absent human hands and human labor, far from the mines and minerals, apart even from the countless rows of machines responsible for its finely wrought construction, now alone the singular and total object for the viewer’s consideration, is seen to assemble itself. It could be accomplished only by disassembling the telephone. Only when the camera was cranked backward did “the telephone appear to go together, instead of coming apart” (WE 1918). It is undeniable that Western Electric knew its supply chain in a radically different way from how contemporary mobile manufacturers know theirs. Maker and miner were more closely coupled. It was possible to imagine a world in which every engineer at Hawthorne could, through the regular dissemination of the Western Electric News or their own work with suppliers, know very well something of the political, geographic, and social circumstances of the materials being assembled there. It would be difficult for even the most conscientious company to replicate those conditions today. The reach of the commodity chain has grown beyond even the already colossal sprawl of the Far Corners. Materials are less identifiable with the geographies that have produced them. Western Electric knew more because it was possible to know more. But it also knew things differently. It had no interest in speaking critically to the environmental or social conditions of the telephone’s distant producers. The audience for its proclamations on the productive apparatus was constrained in ways not comparable to the contemporary moment—less a public, and more a disparate set of subscribers. Dissemination in a 1920s periodical was not synonymous with universal exposure, but a contemporary mobile manufacturer that shares its knowledge is now subject to instantaneous oversight by a whole host of actors: scholars, journalists, and governments. Western Electric offered carefully constructed messages to finely segmented audiences, messages that could not have survived under the kind of scrutiny manufacturers face today. But beyond the discursive differences, the nature of manufacturing, too, has changed. Even as Western researched and refined its own network of production, the telephone’s ability to connect remote geographies had enabled far greater distances between the elements of newly assembled networks, greater even than those required for the circumstances of its own making. Pamphlets and publications extolling some vision of industrial pride are (comparatively) commonplace in the early years of telephonic history, but there are few extant materials explicitly outlining the intentions of the companies producing them, fewer still detailing their construction. One must wonder, is a document like Far Corners of the Earth a reflection of corporate investment in the knowledge of production? Was Western Electric an organization deeply concerned about the companies, peoples, and places of its material supply chain? Knowledge of telephonic production, both real and imagined, came only from a conscious effort at self-reflection and internal investigation, one that had to be published and republished, eagerly and often, by the company and its collaborators. In this sense, the sorts of epistemological projects and internal programs fueling the output of publications like “Voice Highways” and Far Corners—efforts that spanned some thirty-five years—are indicative of an early model for a familiar form. They were audits, or, at least, precursors to contemporary auditory practices, perhaps some of the most significant in the history of electrical manufacture, reaching from the depths of the company’s operations to the widest expanse of its marketing materials. This is a revelatory suggestion given that, despite the heady gestures towards ever- increasing transparency in the digital information age, knowledge about the apparatus of production is produced and distributed in a medium that is remarkably similar to the sort that began nearly one hundred years ago, and with a message remarkably more constrained. Today, as then, this knowledge is incomplete and unstable, unable to account for the totality of the network of production and subject to the limits of imagination, even as it remains of enduring interest to governing bodies, consumers, and companies themselves. Given the historically transformative effects of telecommunicative technologies—connecting increasingly remote sites of manufacture in increasingly dispersed productive chains—we could look with grim foreboding as the mobile phone finds a welcome reception in the hands of operation managers and field agents in the business of contemporary logistics. With the potential for tracking, updating, and communicating through customized interfaces of operation, phones again potentiate a radical revision of not only time and space, but the very productive structures that have produced them. But as the iPhone’s image of its worker first suggested, there may yet be an alternative avenue for a material epistemology of the mobile phone. Laden with sensors of all kinds, the hope for these devices to “know for us” seems ever closer to realization. The productive apparatus now inscribes the potential to engender human recognition and connection within itself, with a worker who has become able “build the apparatus of her own image’s arrival.” (Perlow 2011:254-255) If one of the logics of the mobile phone is of continuous exchange, of replacement, the image of the worker captured on the phone shows the device itself offering a new mechanism of epistemological upgrade. It offers a knowledge and understanding no longer limited to the touch of smooth glass and cold aluminum, or to the artificial social constructions and anthropomorphizations of system dialogs and programmed voices. This knowledge is no longer confined to the pages of advertising circulars and animated industrials, or the bulleted summaries and analyses of audits and reports. It brings not only new forms of sight and sound, but a limitless procession of nonhuman senses and sensibilities from which new imaginations may be built. For the network to be known, it can no longer be seen through only human eyes. The promise of the mobile phone is encoded in its memory. Faced with the splitting of our knowledge of the network of production, there is the hope that the phone, finally, can know it for us—a material epistemology of and by the materials. Published citation: Matthew Hockenberry, “Material Epistemologies of the (Mobile) Telephone,” Anthropology Quarterly, 91(2) (Spring 2018): 485-524. These images have become frequent enough that assembling an exhaustive listing would be a difficult endeavor. So too, would be gathering the diverse sets of comments and critiques around them. For an attempt at the latter, see Ian Cook et al., “iPhone 3G – already with pictures ! (aka ‘iPhone Girl’),” Follow the Things, [http://followthethings.com/iphonegirl.shtml] (September 2012). For the latter, consider the iOS game “Phone Story” produced by Molleindustria (2011), and the satirical publication of the “iPhone 4CF” (conflict-free) by the Yes Men (2010). These sources comprise several prominent accounts of supply chain contamination that came to public attention in 2007 and 2010, beginning with Mattel recalling toys contaminated with lead paint and Chinese suppliers being implicated in the death of animals that consumed tainted wheat gluten in pet food. Later incidents include McDonald’s distribution of cadmium-tainted drinking glasses and Johnson and Johnson’s recall of Tylenol that had been exposed to chemicals leaching from wooden shipping pallets and improperly manufactured children’s medication. As Freud writes in “Fetishism,” “In later life a grown man may perhaps experience a similar panic when the cry goes up that Throne and Altar are in danger, and similar illogical consequences will ensue…something else has taken its place, has been appointed its substitute, as it were, and now inherits the interest which was formerly directed to its predecessor” (1927:152-153). This can be seen in earlier critiques of supply chains, for example, widespread concern on the impact of globalization that manifested in the 1990s over labor conditions in Nike’s supply chain. See Sydney H. Schanberg, “On the Playgrounds of America, Every Kid’s Goal is to Score: In Pakistan, Where Children Stitch Soccer Balls for Six Cents an Hour, the Goal is to Survive,” Life Magazine (June 1996): 38-48. In one 2009 piece, for example, Thomas Mucha follows the customary quote of assurance from an Apple spokesperson with the immediate caveat that “these Asian supply chains are notoriously complex and murky,” with a landscape of production where “contractors shift orders across borders and between factories and subcontractors.” Thomas Mucha, “Silcon Sweatshops: Gadget Factories Take a Toll on Workers,” Wired (November 17, 2009). This section uses various collections from the AT&T Archives and the National Museum of American History. Reference copies of publications at the NMAH can be found in the trade literature collections for the Western Electric Company, the American Telephone and Telegraph Company, and the other Bell System and regional telephones companies; the AT&T/Bell Film Collection; the N.W. Ayer Collection (primarily advertisements and campaign correspondence); the Warshaw Collection of Business Americana; the Western Union Telegraph Company Records; and the Elisha Gray Collection. To the extent possible, these have been considered with comments available in the broader literature of the period. These evangelical advertisements appeared in a diverse array of external publications—from mainstream outlets like American Homes and Gardens to more technically minded periodicals like Popular Science and the Industrial Engineer—even as they remained frequent features in regional telephone company magazines. The company’s earliest advertisement had promised that, “having purchased the stock and tools of the Western Union Company’s Cleveland shop,” the firm would “manufacture to order and keep on hand all articles of telegraph machinery and supplies” according to the “Western Union standard patterns.” Customers could expect to obtain a “complete outfit of electrical apparatus,” with all variety of “wire, insulators, jars, tumblers, zincs, acids, salts, mercury, relays, registers, keys, sounders, repeaters, switches, lightning rods, induction coil, carbonized paper, and electro-plating materials.” See The Journal of the Telegraph, particularly August 1, 1868 and January 15, 1869, for the company’s development in its early days. In size, it was generally more comparable to Westinghouse than the Edison legacy General Electric. Quoting Edgar Bloom, Western Electric president, in the decision for Lindheimer v. Illinois Bell Tel. Co., 292 US 151 (1934), 1:409. See also George David Smith, The Anatomy of a Business Strategy: Bell, Western Electric, and the Origins of the American Telephone Industry (Baltimore: Johns Hopkins University Press, 1985), xxi. Henry Thayer, who had been president of Western Electric since 1909, reflected on this change in a piece copied in the Bell Telephone News. He would go on to become the president of AT&T in 1919. “Everyone” the company wrote in one of its explicit references to scientific management, “recognizes the economy of telephoning rather than calling personally on business associates, but more time is wasted in making visits about your own plant. The executive who believes in the theory of scientific management equips his office with Western Electric Interphones. He needs only to press a button to talk with any department of his business. No operator—no waiting.” Western Electric, Inter-phones Series, N.W. Ayer Collection, NMAH, 1911. This idea of electric efficiency permeated later notices. “Is your organization running you?” asked one in 1916. “Are your department heads and foremen continually at your elbow? Are you besieged by your subordinates with a thousand interruptions?” “Wasted steps,” another suggested, “are wasted dollars…little thieves that carry off the profits, yet often go unchecked.” It seemed that even the mundane objects of office life could be made to testify to this inefficiency: “if your floors could show the steps you waste…” Western Electric Inter-phones Series, N.W. Ayer Collection, NMAH, 1916. Western would become associated, in its later years, with the more bureaucratic adaptation of workflow analysis and movement studies pioneered by Frederick Taylor. Indeed, their Hawthorne Works would famously become the site of Elton Mayo’s experiments with worker productivity in the 1920s. But it might also be suggested that Western simply followed from its founding amid what Joseph Litterer and JoAnne Yates describe as the systemic, rather than scientific, management that had infiltrated business literature after the 1870s. See JoAnne Yates, Control Through Communication: The Rise of System in American Management (Baltimore: Johns Hopkins University Press, 1989). Later system advertisements referenced this tension more explicitly. The telephone is “at your service, but not for sale.” “Though the Bell system has nothing for sale but service,” it nevertheless “controls one of the greatest electrical manufacturing enterprises in the country, the Western Electric Company.” AT&T, “At Your Service, But Not For Sale,” National Museum of American History, N.W. Ayer Collection, 1931. The company published at least two editions of the pamphlet in rapid succession, with the “B” edition making a number of revisions in the illustration of supply sources. One was a result of the divesture of Alcoa’s Canadian Aluminum Extraction to Alcan (then the Aluminum Company of Canada). The corresponding change to the supply chain, a move from Canadian to US sources, was reflected on the Far Corners map. At least two later editions were published, one in 1935 and another in 1939. These demonstrated more substantial revisions, with an updated supply chain map and covers that exchanged the candlestick for a desk-set style telephone. I’m heavily indebted to Mara Mills for bringing the original document to my attention. As AT&T’s publicity director Arthur Wilson Page remarked at the Bell Telephone Systems Publicity Conference in April 1927, “this particular department of ours is not pressed with the commercial end of this business; it is not engaged for the immediate money making, the physical preparation of plant, and it is freer, if it has the brains and perspective and intention, to be the custodian of the ideals of the company.” Accounts safeguarding these sorts of ideals were indeed featured regularly in the Western Electric and Bell Telephone News between 1925-1930, and, less often, in the independent telephone journals. The organization left behind was more supplier than distributor or manufacturer. It was the Western Electric that allowed “companies in the Bell System to buy equipment and supplies of the highest quality at reasonable prices.” It was the Western Electric that served the Bell System “by maintaining a nation-wide system for the rapid delivery of material and apparatus.” Bell Telephone Systems, “Did You Ever See THIS Before?” National Museum of American History, N.W. Ayer Collection, 1936. Adams, Stephen and Orville Butler. 1999. Manufacturing the Future: A History of Western Electric. Cambridge: Cambridge University Press. Appadurai, Arjun. 2014. “Mediants, Materiality, Normativity.” Presentation at Media, Materiality, and Infrastructure, New York University, New York, March 7. Appiah, Kwame. 2006. Cosmopolitanism: Ethics in a World of Strangers. New York: W.W. Norton & Company. American Telephone and Telegraph (AT&T). 1909. “A Highway of Communication.” National Museum of American History, N.W. Ayer Collection. _____1910. “Annihilator of Space.” National Museum of American History, N.W. Ayer Collection. _____1913a. “A Proverb of Bell Service.” National Museum of American History, N.W. Ayer Collection. _____1913b. “The Merger of East and West.” National Museum of American History, N.W. Ayer Collection. _____1914. “Unseen Forces Behind Your Telephone.” National Museum of American History, N.W. Ayer Collection. _____1922. “As If Across a Desk.” National Museum of American History, N.W. Ayer Collection. Baird, Davis. 2004. Thing Knowledge: A Philosophy of Scientific Instruments. Berkeley: University of California Press. Balakrishnan, Gopal. 2009. “Speculations on the Stationary State.” New Left Review 59: 5-26. Barboza, David. 2007. “China Food Mislabeled, U.S. Says.” New York Times, May 3. Barboza, David and Louise Story. 2007. “Mattel Issues New Recall of Toys Made in China.” New York Times, August 14. Bell Systems. 1931a. “Carrying New York’s Telephone Wires Under a River.” Juvenile Series. National Museum of American History, N.W. Ayer Collection. _____1931b. “How Telephone Cables March Down the Field.” Juvenile Series. National Museum of American History, N.W. Ayer Collection. _____1931c. “Telephone Wires Leaping the Gila Valley.” Juvenile Series. National Museum of American History, N.W. Ayer Collection. Benson, Peter and Stuart Kirsh. 2010. “Capitalism and the Politics of Resignation.” Current Anthropology 51(4): 459-486. Best Telephone Company. 1896. National Museum of American History, Trade Pamphlet Collection. Boltanski, Luc and Eve Chiapello. 2007. The New Spirit of Capitalism. New York: Verso. Brown, Bill. 2001. “Thing Theory.” Critical Inquiry 28(1): 1-22. Butler, Judith. 2007. “Torture and the Ethics of Photography.” Society and Space 25(6): 951- 966. Carey, James. 1983. “Technology and Ideology: The Case of the Telegraph.” Prospects 8: 303-325. Carmi, Elinor. 2015. “Taming Noisy Women: Bell Telephone’s Female Switchboard Operators as a Noise Source.” Media History 21(3): 313-327. Carrier, James and Peter Luetchford. 2012. Ethical Consumption: Social Value and Economic Practice. Oxford: Berghahn Books. Chang, Leslie. 2008. Factory Girls: From Village to City in a Changing China. New York: Spiegel & Grau. Christopher, Martin. 2016. Logistics & Supply Chain Management. Upper Saddle River, NJ: FT Press. Collins, James. 1908. “The Western Electric.” Printer’s Ink 65(13): 1-7. Daisey, Mike. 2011. “The Agony and the Ecstasy of Steve Jobs.” Performance at The Public Theatre, New York, November 5. Downey, Gregory. 2002. Telegraph Messenger Boys: Labor, Technology, and Geography, 1850-1950. London: Routledge. Duhigg, Charles, et al. 2012. “The iEconomy” Series. New York Times. Farquhar, Judith. 2015. “Metaphysics at the Bedside.” In Howard Chiang, ed. Historical Epistemology and the Making of Modern Chinese Medicine, 219-236. Manchester: University of Manchester Press. Fischer, Claude. 1994. America Calling: A Social History of the Telephone to 1940. Berkeley: University of California Press. Frankel, Todd, Peter Whoriskey, et al. 2016. “Mobile Power, Human Toll” Series. Washington Post. Freud, Sigmund. 1938. “Splitting of the Ego in the Process of Defense.” The Standard Edition of the Complete Psychological Works of Sigmund Freud, Volume XXIII. _____1927. “Fetishism.” The Standard Edition of the Complete Psychological Works of Sigmund Freud, Volume XXI. Friends of the Earth, Netherlands. 2009. “Mining Matters: Unacceptable Metal Mining in Developing Countries and the Responsibilities of Companies in the Netherlands.” Amsterdam: Friends of the Earth. _____2012. “Mining for Smartphones: The True Cost of Tin.” Amsterdam: Friends of the Earth. Gilman, Nils, Jesse Goldhammer, and Steven Weber. 2011. Deviant Globalization: Black Market Economy in the 21st Century. London: Bloomsbury. Global Witness. 2009. “Faced with a Gun, What Can You Do? War and the Militarization of Mining in Eastern Congo.” London: Global Witness. Goggin, Gerard. 2006. Cell Phone Culture: Mobile Technologies in Everyday Life. New York: Routledge. Grace, Helen. 2013. “iPhone Girl: Assembly, Assemblage and Affect in the Life of an Image.” In Chris Berry, Janet Harbord, and Rachel O. Moore, eds. Public Space, Media Space, 135-161. London: Palgrave MacMillan. Gray, Rob, Dave Owen, and K.T. Maunders. 1987. Corporate Social Reporting: Accounting and Accountability. Upper Saddle River, NJ: Prentice Hall. Greenpeace. 2007. “Missed Call: iPhone’s Hazardous Chemicals.” Amsterdam: Greenpeace. Heidegger, Martin. 1977. The Question Concerning Technology and Other Essays. New York: Harper. Hochfelder, David. 2012. The Telegraph in American, 1832-1920. Baltimore: Johns Hopkins University Press. Hutcheon, Stephen. 2008. “Net mob search for iPhone Girl’s identity.” Sidney Morning Herald, August 28. Ito, Mizuko. 2005a. “Mobile Phones, Japanese Youth, and the Re-placement of Social Contact.” In Rich Ling and Per E. Pedersen, eds. Mobile Communications: Re-negotiation of the Social Sphere, 131-148. New York: Springer-Verlag. _____2005b. With Misa Matsuda and Daisuke Okabe. Personal, Portable, Pedestrian: Mobile Phones in Japanese Life. Cambridge: MIT Press. John, Richard. 2010. Network Nation: Inventing American Telecommunications. Cambridge: Harvard University Press. Kopytoff, Igor. 1986. “The Cultural Biography of Things: Commoditization as Process.” In Arjun Appadurai, ed. The Social Life of Things, 64-91. Cambridge: Cambridge University Press. Latour, Bruno. 1987. Science in Action: How to Follow Scientists and Engineers Through Society. Cambridge: Harvard University Press. _____2005. Reassembling the Social: An Introduction to Actor-Network-Theory. New York: Oxford University Press. _____2010. On the Modern Cult of the Factish Gods. Durham: Duke University Press. Law, John. 1992. “Notes on the Theory of the Actor-Network: Ordering, Strategy, and Heterogeneity.” Systems Practice 5(4): 379-393. Levinas, Emmanuel. 1969. Totality and Infinity: An Essay on Exteriority. Pittsburgh: Duquesne University Press. Lipartito, Kenneth. 1989. The Bell System and Regional Business: The Telephone in the South, 1877-1920. Baltimore: Johns Hopkins University Press. Liu, Kaiming and Xin Deng. 2005. “Day and Night at the Factory: Working Conditions of Temporary Workers in the Factories of Nokia and its Suppliers in Southern China.” Helsinki: Finnwatch. Locke, Richard. 2003. “The Promise and Perils of Globalization: The Case of Nike.” In Richard Schmalensee and Thomas A. Kochan, eds. Management: Inventing and Delivering Its Future, 39-74. Cambridge: MIT Press. Marx, Karl. 1976. Capital, Volume One. Ben Fowkes, trans. London: Penguin Books. Martel, Caroline. 2004. The Phantom of the Operator. New York: Women Make Movies. Mattelart, Armand. 1996. The Invention of Communication. Minneapolis: University of Minnesota Press. Maurer, Bill, Taylor C. Nelms, and Stephen C. Rea. 2013. “‘Bridges to Cash’: Channeling Agency in Mobile Money.” Journal of the Royal Anthropological Institute 19(1): 52-74. McFarland, Richard G., James M. Bloodgood, and Janice M. Payan. 2008. “Supply Chain Contagion.” Journal of Marketing 72(2): 63-79. Mirzoeff, Nicholas. 2005. “Network Subjects: Or, the Ghost is the Message.” In Wendy Hui Kyong Chun, ed. New Media, Old Media: A History and Theory Reader, 335-346. New York: Routledge. Mucha, Thomas. 2009. “Silcon Sweatshops: Gadget Factories Take a Toll on Workers.” Wired, November 17. Nakamura, Lisa. 2011. “Economies of Digital Production in East Asia: iPhone Girls and the Transnational Circuits of Cool.” Media Fields Journal 5(2): 1-10. Perlow, Seth. 2011. “On Production for Digital Culture: iPhone Girl, Electronics Assembly, and the Material Forms of Aspiration.” Convergence 17(3): 245–269. Pietz, William. 1985. “The Problem of the Fetish, I.” RES: Anthropology and Aesthetics 9: 5-17. Pickering, Andrew. 1995. The Mangle of Practice: Time, Agency, and Science. Chicago: University of Chicago Press. Power, Michael. 1997. The Audit Society: Rituals of Verification. Oxford: Oxford University Press. Riles, Annelise. 2006. Documents: Artifacts of Modern Knowledge. Ann Arbor: University of Michigan Press. Rivoli, Pietra and Sandra Waddock. 2011. “‘First They Ignore You…’: The Time-Context Dynamic and Corporate Responsibility.” California Management Review 53(2): 87-104. Roy, Ananya. 2011. “Postcolonial Urbanism: Speed, Hysteria, Mass Dreams.” In Ananya Roy and Aihwa Ong, eds. Worlding Cities: Asian Experiments and the Art of Being Global, 307-335. Oxford: Blackwell. Schanberg, Sydney. 1996. “On the Playgrounds of America, Every Kid’s Goal is to Score: In Pakistan, Where Children Stitch Soccer Balls for Six Cents an Hour, the Goal is to Survive.” Life Magazine, June. Schor, Elana. 2010. “Recall of Cadmium-Tainted Glasses by McDonald’s Sparks Debate Over Toxic Metal.” New York Times, June 8. Sekula, Allan. 1986. “The Body and the Archive.” October 39 (Winter): 3-64. Singer, Natasha. 2010a. “In Recall, a Role Model Stumbles.” New York Times, January 17. _____2010b. “Children’s Tylenol and Other Drugs Recalled.” New York Times, May 1. Sontag, Susan. 2003. Regarding the Pain of Others. New York: Farrar, Straus and Giroux. Smith, George David. 1985. The Anatomy of a Business Strategy: Bell, Western Electric, and the Origins of the American Telephone Industry. Baltimore: Johns Hopkins University Press. Spyer, Patricia. 1997. Border Fetishisms: Material Objects in Unstable Spaces. London: Routledge. Strathern, Marilyn. 2002. Audit Cultures: Anthropological Studies in Accountability, Ethics and the Academy. New York: Routledge. Thayer, Henry. 1916. “The Western Electric Company and Its Relation to the Bell System.” Bell Telephone News 6(3): 5-8. Tsing, Anna. 2005. Friction: An Ethnography of Global Connection. Princeton: University of Princeton Press. United States Department of Labor, Bureau of International Labor Affairs, Office of Child Labor, Forced Labor, and Human Trafficking. 2009. “The Department of Labor’s List of Goods Produced by Child Labor or Forced Labor Report Required by the Trafficking Victims Protection Reauthorization Acts of 2005 and 2008.” Washington DC: US Government Printing Office. United States Government Accountability Office. 2014. “Conflict Minerals: Stakeholder Options for Responsible Sourcing Are Expanding, But More Information on Smelters Is Needed.” Report to Congressional Committees. Washington DC: US Government Printing Office. Varnelis, Kazys and Anne Friedberg. 2008. “Place: The Networking of Public Space.” In Kazys Varnelis, ed. Networked Publics, 15-42. Cambridge: MIT Press. Walker, Brett. 2010. Toxic Archipelago: A History of Industrial Disease in Japan. Seattle: University of Washington Press. Western Electric (WE). 1912. “Call Your Foreman with Western-Electric Inter-Phones.” Inter-phones Series. National Museum of American History, N.W. Ayer Collection. _____1914. “Every Man Within Earshot.” Inter-phones Series. National Museum of American History, N.W. Ayer Collection. _____1915a. “Electricity: The Twentieth Century Servant.” National Museum of American History, N.W. Ayer Collection. _____1915b. “Quick Inter-communication.” Inter-phones Series. National Museum of American History, N.W. Ayer Collection. _____1915c. “The Making of the Voice Highways.” National Museum of American History, Trade Pamphlet Collection. _____1916. “Why Have Two Standards of Effeciency?” National Museum of American History, N.W. Ayer Collection. _____1918. “The World’s Telephone Workshop.” Charles D. Wrege Collection of Audio-Visual Materials, Kheel Center for Labor-Management Documentation and Archives, Cornell University Library. _____1919. “When the Western Electric Company Started Fifty Years Ago.” Western Electric News 8(9): 20-21. _____1923a. “Have Faith in Chicago.” National Museum of American History, Trade Pamphlet Collection. _____1923b. “These Men Made Your Telephone.” Raw Materials Series. National Museum of American History, N.W. Ayer Collection. _____1927. From the Far Corners of the Earth. New York: McGraw-Hill. _____1928. The Inside Story of the Telephone. New York: Western Electric. _____1932. “A Democracy in Industry.” National Museum of American History, Trade Pamphlet Collection. Yoshida, Miya, Christiane Mennicke-Schwarz, and Paul Feigefeld. 2012. The World in Your Hand: On the Everyday Global Culture of the Mobile Phone. Liepzig: Spector. Zimmerman, Virginia. 2009. “‘The Weird Message from the Past’: Material Epistemologies of Past, Present, and Future in the Nineteenth Century.” Victorian Periodicals Review 42(2): 114-135. Žižek, Slavoj. 2008. The Sublime Object of Ideology. New York: Verso. This entry was posted in Writing and tagged apple, epistemology, foxconn, logistics, mobile phones, production, supplychains, supplystudies, telephone. Bookmark the permalink.